Why are States Buying and Using Machines that Don’t Pass Testing? All along there have been problems with electronic voting. Again and again election officials and observers have spoken up, only to be ignored. In 2008 an election official in Oakland County Michigan noticed something alarming.with ES&S optical scan machines. Here is the story from Kim Zetter of Wired. Different Tallies for the same ballots every time!! Not reproducible errors. Different tallies each time. This is an important differentiation. Different errors and you have a real significant issue. Here is the letter from the Oakland County Clerk to the EAC, requesting urgent assistance with this matter. Eight percent of communities reported inconsistent vote totals during their logic and accuracy testing. 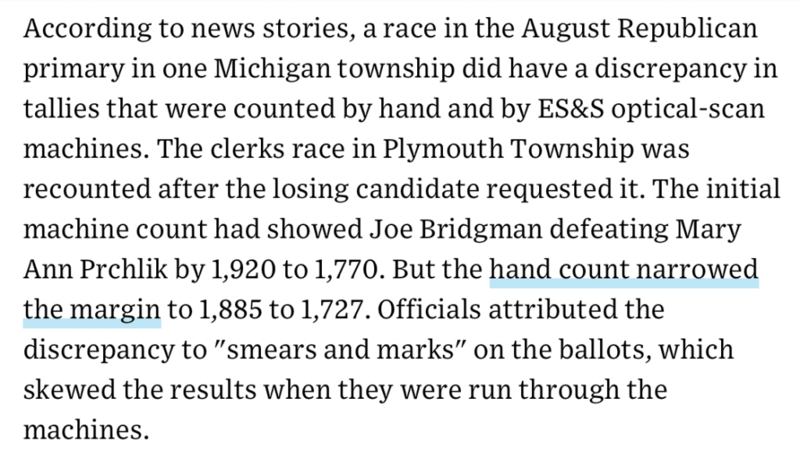 The same ballots, run through the same machines, yielded different results each time. The problem could occur and election workers would have no inkling that ballots are being misread. Local clerks are prohibited from performing any maintenance/cleaning on the machines as it voids the warranties. ES&S has not performed any preventative maintenance since the machines were delivered three years ago. Twenty years with these electronic machines, and all we are talking about is counting. Every other industry in the world has mastered the complexities of adding one plus one. How long would Banks use ATM’S that handed out the wrong amount of money? These states are using overly complex machines. 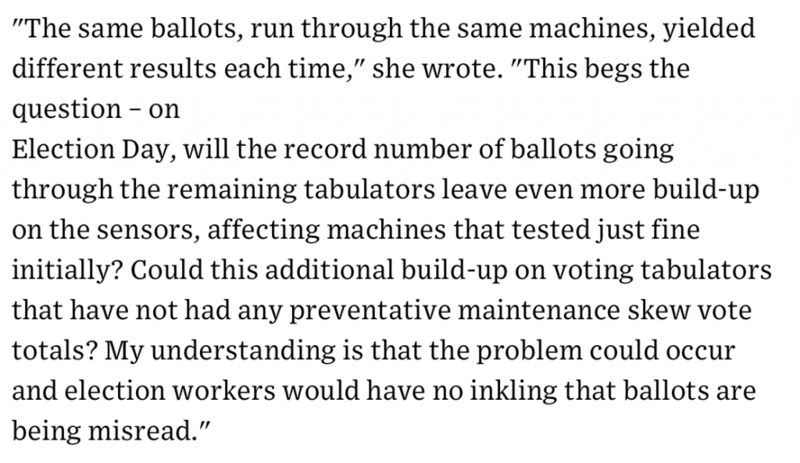 In many cases machines that the poll workers have no idea how to handle when things go wrong. Machines that prohibit the States from looking into them because of agreements the States sign – against their best interest. Billions of dollars spent. Long term contracts. Machines that are not examinable. Companies that don’t care. And then we wind up where we are. Magic boxes. Doing magic things. All the time preventing us from knowing what is happening. This is our election infrastructure. But don’t say anything. Everything is fine.